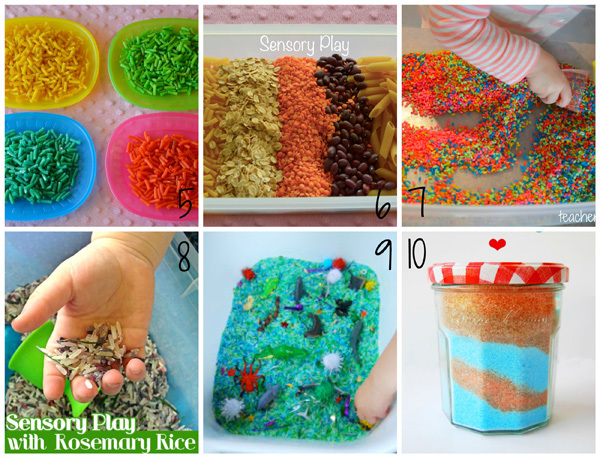 Looking for sensory play ideas for your toddler, preschool or kindergarten? Lauren has put together a fabulous list ideas from all of the Childhood 101 contributors. This list sure is a keeper! The possibilities for sensory play are endless, and not only bucket loads of fun for little people, but really beneficial for their early development. Young children love to touch, see, listen and explore when they play, and some of the ideas below encourage them to engage their sense of taste and smell too! Today the team at Childhood 101 are bringing you this super duper collection of sensory activities perfect for toddlers. And don’t worry – sensory play doesn’t always mean ‘messy play’! Looking for sensory ideas for older children, check out Kaleidoscope; Hands On Explorations in Colour (and Color!) for Kids. 1. Cloud dough – only two ingredients needed, simply mix 8 parts flour to 1 part oil (use any kitchen oil for toddlers still putting things in their mouth, coconut oil also adds a lovely scent). 2. Kinetic sand is such a magical sensory product. It’s difficult to explain how amazing it is – so if you get the chance have a feel for yourself. 3. 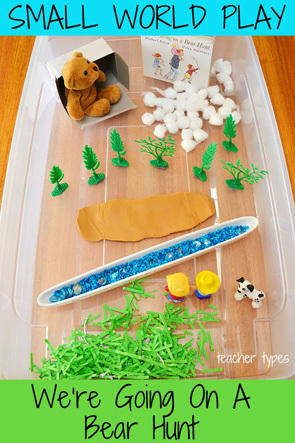 Ali from At Home with Ali has created a lovely inviting beach themed sensory bin with sand, blue water and lots of fun things to play with! 4. 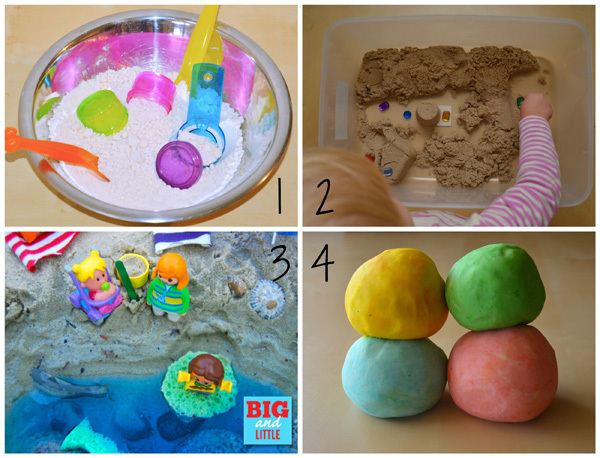 A sensory play round up post wouldn’t be complete without an awesome playdough recipe (this is also a great introduction to sensory play if you’re not sure what it’s all about). 5 & 6. 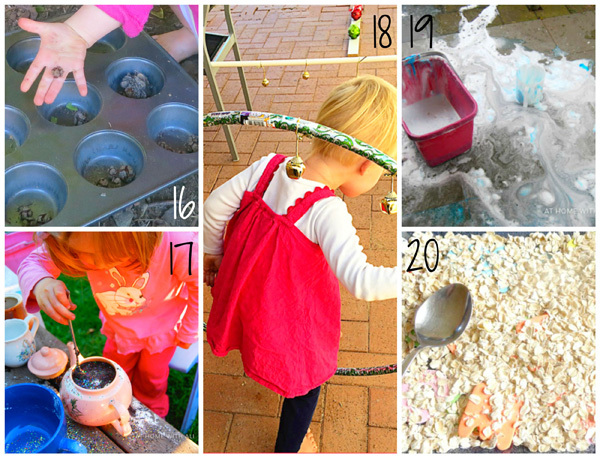 Sometimes you can whip up a sensory bin with items found in your pantry – pasta, food colouring, lentils, beans, oats…. Here’s the link to read more. 7. Lauren from Teacher Types has found the perfect foolproof recipe for rainbow rice. Check out the link to discover the secret ingredient! 8. Another fantastic sensory experience with rice – by simply adding rosemary the rice is transformed with a beautiful scent! What a feast for the senses – touch, hear, smell and see! 9. Once you’ve mastered the skill of dying rice, there are so many possibilities to create ‘invitations to play’, such as this marine themed sensory play. 10. Still on the theme of items found in your pantry, check out At Home with Ali’s salt play. 11. Moving on now to some sensory fun with paint; Childhood 101 shares the ingenious combination of bubble wrap with finger painting! 12. When the weather starts to warm up it’s a great opportunity to take your sensory play experiences outdoors. Ali has some fantastic Summer fun messy play ideas including mixing water with food colouring. 13. Ever heard of glitter finger paint that is also edible? Sounds too good to be true doesn’t it! This recipe for sensory play is perfect for little ones who are still putting everything in their mouths! Thanks to Childhood 101 contributor Kylie for this on. 14. Tape resist painting is an old favourite and toddlers love painting with their hands before they’re ready to attempt using paint brushes. 15. 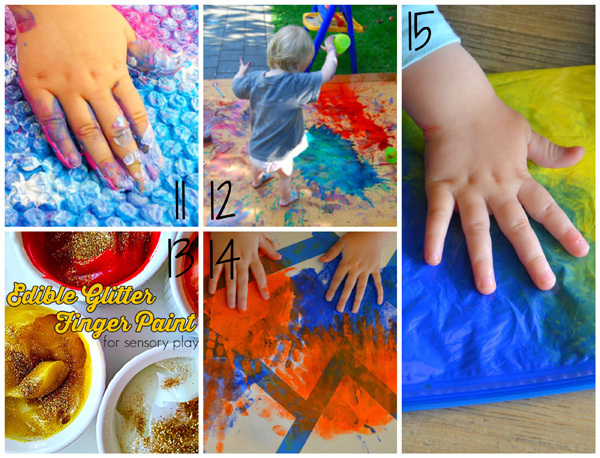 Want to try some painting sensory activities but without the mess? Teacher Types has come up with 7 ways to have clean fun with zip lock bag painting. A great post for all ages! 16. Outdoor Kitchens provide a fantastic platform for messy sensory nature play. Guest blogger Benita featured her amazing outdoor kitchen over at Teacher Types. Wouldn’t your toddler love to make mud pies and flower soup? 17. There’s another fantastic outdoor café over at At Home with Ali. She includes some gorgeous ceramic bits and pieces gathered and collected from op-shops! 18. For an activity to get those bodies moving and encourage spatial awareness development, Christie from Childhood 101 has created a sensory play obstacle course that really gets kids listening. 19 Have fun exploring shaving foam. 20. Jodie from Growing Book by Book has come up with an awesome collection of sensory materials for every letter of the alphabet. She also hides foam letters amongst the materials to encourage early reading and literacy skills. What a huge collection! 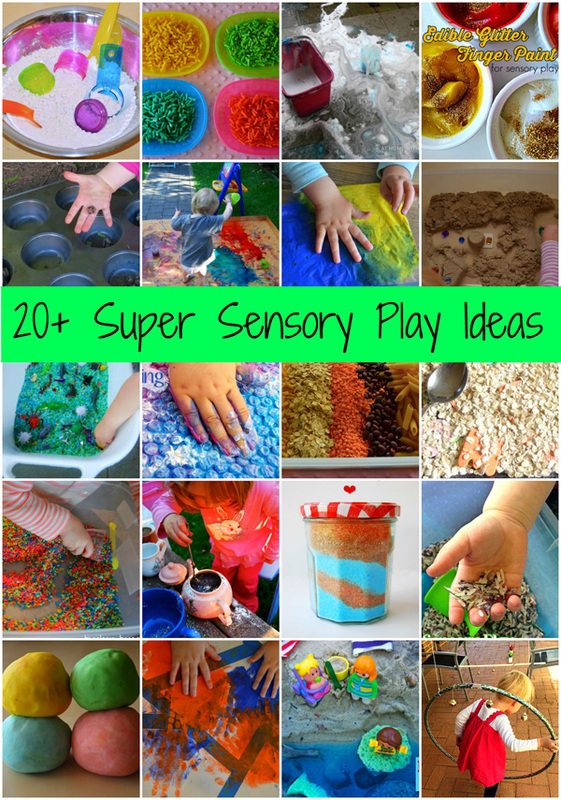 I hope you’re feeling inspired to try some of these sensory play ideas. We invite you to share your favourite in the comments below. 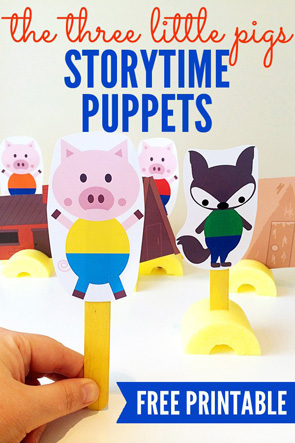 Love these ideas - I have been looking for sensory play ideas for my twins! Thanks for the advice!